Papua New Guinea, originally uploaded by Alf Gillman. This Flying Fort E-model should have been bound for Britain along with thirty-one identical sisters as part of RAF Coastal Command’s allotment under the Lend-Lease Act. It arrived at Cheyenne, Wyoming—the marshalling area for Lend-Lease birds—on or around May 26th, 1942. Boeing had applied basic RAF markings such as roundels on the wings and fuselage, and the RAF registry FL 461, but retained the aircraft’s Army Air Force tail code41-9234 for its American transit. (The tail would have been repainted once the bomber reached its final destination in the United Kingdom.) During the first week of August, however, four of the thirty-one were reassigned to the AAF’s 19th Bomb Group in Australia; they made the transit via Hamilton Field, California, and Hickam Field, Hawaii. The war in the Pacific was hard on the four bombers, only 3 months after their arrival two of them had been lost: one on October 5th, 1942, during a raid on Japanese-held Vunakanau in Rabaul; the other ditched off Cooktown, Queensland, on October 29th. But when the 19th Bomb Group rotated home at the end of 1942, 41-9234 did not go with them; it and its sister were passed to the 43rd Bomb Group at Seven Mile Drome (now Jacksons International Airport [AYPY]). On January 8th, 1943, the aircraft was on its 13th mission, under the command of 1st Lieutenant Ray S. Dau of Arlington, Virginia. Over the past two days the 43rd Group had been hammering a Japanese convoy bound for Lae, Rabaul, but the convoy was well-defended by its cruiser and destroyer escorts and eventually made port. Now the bomber group was trying valiantly to destroy the ships in port before their cargo could be offloaded. And so began a desperate day as Allied airmen battled though foul weather and aggressive enemy fighters to attack the ships as the unloaded their cargo, which included about 4,000 troops. The 43rd Bomb Group sent its B-17’s out on small missions all day. Available records indicate that 63rd Squadron’s “Lulu Belle” arrived over Lae at 4:45 and at 06:00 bombed a “cluster of lights: Four B-17s from the 64th Squadron attacked the convoy at 09:30 claming one near miss. They reported that heavy, accurate AA fire began five miles out from the target. At 13:00 Captain William Thompson in the 63rd Squadron’s Panama Hattie took off from Jackson Aerodrome with Lt. Ray Dau from the 65th Squadron as his wingman. Ray Dau and his crew were flying 41-9234 and it was their 13th mission. A third B-17 was forced to turn back soon after takeoff, but Thompson and Dau went on. The two B-17’s reached Lae at midday fighting their way through a swarm of Japanese fighters. On the bomb run, the B-17 was hit by AA fire which shattered the nose. The B-17 was being rocked by fire from guns on the ships, shore and was hit at least three times. Flight Sergeant Lloyd DuMond was wounded and the top turret was put out of action, both port engines were crippled and the controls were damaged. The tail turret gunner, Sgt. Henry Bowen was badly wounded by shrapnel. Still the ordeal of 41-9234 and its crew was not over; there was a 30 minute running battle with the Japanese fighters during which Dau’s gunners claimed three Zeros destroyed. With only two good engines, Dau and his copilot Lt. Donald Hoggan could neither climb nor turn. Dau recalled, “We were headed up a small valley and couldn’t get over the mountains. I knew it was just a matter of time, so I began looking for a soft place to set her down. We glided in on the side of a mountain at about 110 miles an hour, and as luck would have it, there were no trees – nothing but nice soft grass – so we slid along into a crash landing”. — Birdsall, Steve. 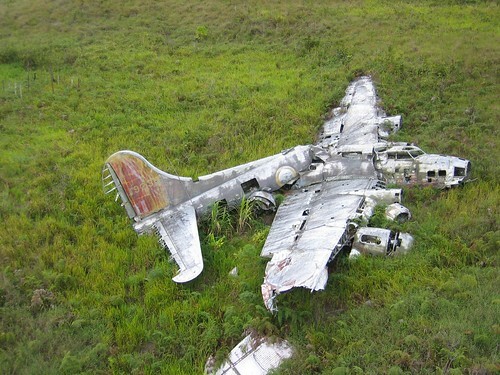 “B-17 at Black Cat Pass.” PacificWrecks.org, 30 September 2009. The bomber’s crash was observed by Papuan scouts and the crew was carried down to Wau Airfield in litters, where they were returned to Port Moresby via an RAAF Hudson. Pacific Wrecks has an excellent description of events as well as a full listing of the crew. Here are more images of the crash site from Flickr. 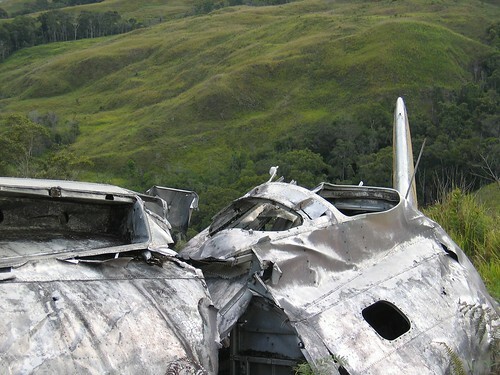 Crashed WWII bomber in Papua New Guinea, originally uploaded by Mangiwau / Michael Thirnbeck.